It’s one month until Christmas! it’s time to get shopping or get making! 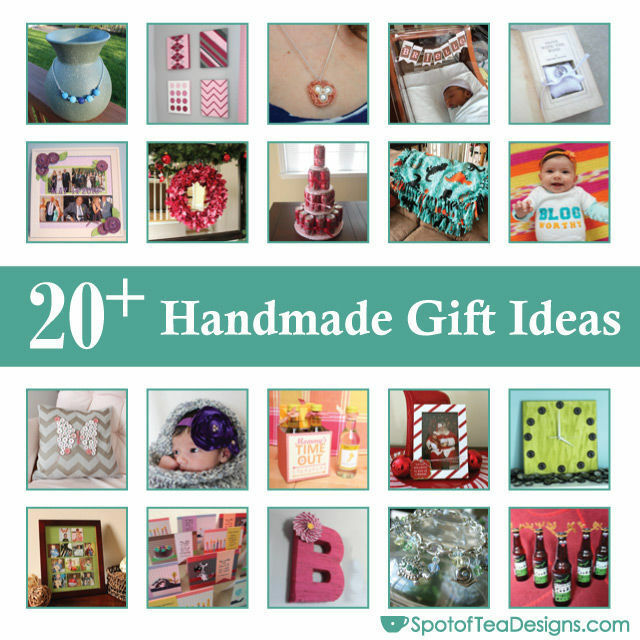 I put together a list of 20+ Handmade Gift Ideas from things I’ve shared on my blog over the past few years. Find a topic and get crafting people! PS If you do happen to make something inspired by a Spotofteadesigns.com craft, I’d love to see it! I’m working on a “Reader’s Feature” post for 2015 and would love to see more submissions! Please contact me here. 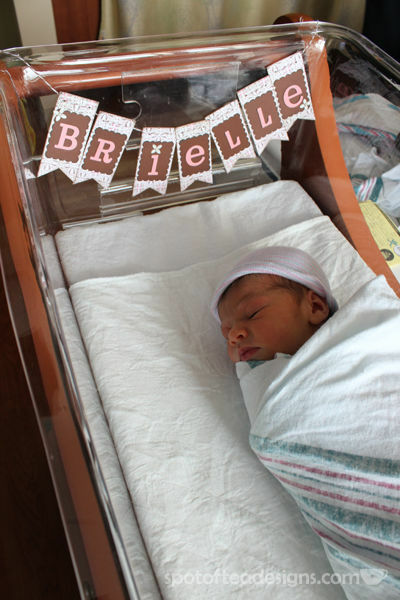 Hospital Name Garland – if you know someone who’s expecting and they already revealed the name, make a little garland they can hang on the hospital crib and bet he envy of all the other babies on the floor! Baby Headbands – Make them with satin flowers or felt shapes but make them in every color! Custom Baby Onesies – use iron on letters to write your message of choice or create a onesie for each month of a babies first year! Knotted Fleece Blanket – perfect for snuggling for those cold winter nights! Thank You Cards – craft up a set of thank you cards for someone’s upcoming wedding or new baby! Or make a generic set of thank yous. Or a set with random themes that can be used all year long! Hidden Treasure Books – hollow out an old book and turn it into a secret hiding spot on your bookshelf! Beer Cap Clock – Great for the man cave or good old dad! Painted Canvas Art – Made a coordinated set of canvases with a geometric pattern, animal themed designs or a simple Jackson Pollock style piece. Yarn Wrapped Letters – make it for a new baby, decorate a playroom wall or just do a single initial for a friend! Glittered Striped Frame – Make it for Christmas or any season, but add some glitter to a boring white frame! Decorative Wreath – use up those fabric scraps to make something for the holiday season. Stenciled Pillow – add the extra element of a fun button collage. Soda Can Cake – Can easily be done with beer cans too! Reinbeers – Dress up a set of their favorite craft beer or bottled root beer! Bird’s Nest Necklace – add pearls or gems inside the necklace to represent kids or grandkids. Wood Bead Necklace – This simple DIY involves painting and stringing. Garden Charm Bracelet – If necklaces aren’t their thing, collect charms on a charm bracelet in a specific color palette.